Psychopaths are described as incapable of empathy, guilt, or loyalty to anyone but themselves; still, spotting a psychopath isn't easy. 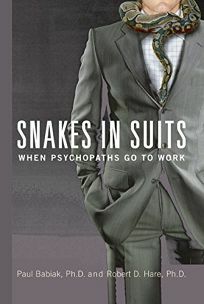 Babiak, an industrial and organizational psychologist, and Hare (Without Conscience), creator of the standard tool for diagnosing psychopathology, present a study of the psychopath in the corporate landscape. A common description of psychopathology states that subjects ""know the words but not the music;"" Babiak and Hare state that ""a clever psychopath can present such a well-rounded picture of a perfect job candidate that even seasoned interviewers"" can be fooled. In between a disposable series of narrative acts that follow a psychopath's progress (""Act I, Scene I - Grand Entrance;"" ""Act III, Scene II - An Honest Mistake?"" ""Act V, Scene I - Circle the wagons""), thorough research and anecdotes from a number of sources-current literature, news media, and showbiz among them-to illuminate the power of the psychopath to manipulate those around him, as well as what strategies can be used to identify and disarm him. Clear and complete, this is a handy overview for managers and HR, with enough ""self-defense"" techniques to help coworkers from getting bit.